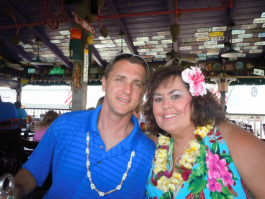 Lyzette Maroszek and her husband Brian Maroszek in Maui, Hawaii for her son's Make a Wish trip. Welcome from the Maroszek Family! From left to right. Brayden- Freshman and St. Norbert College, Brody- Freshman at Bay Port, Brian- my husband who works at Humana, Mrs. Maroszek, and Brock- Junior at Bay Port High School. Welcome to my personal page on our classroom website! This is our second year on the web and I am so happy you dropped in for a visit! On this page you will get the opportunity to learn a little bit more about me including my background, education, experience and family. I look forward to learning more about each of you very soon! I am a proud graduate of Bay Port High School in 1988! Go PIRATES! I went on to work at a bank where I was a Management Trainee while I was in college. Because I was totally unsure what I wanted to go to college for, I followed my parents advice and attended the University of Wisconsin Green Bay where I graduated with a Bachelors of Science Degree in Business Administration with a Major in Finance and a Minor in Economics. I received a wonderful offer from a local insurance company after graduation, for a Corporate Trainer position which I accepted. I went on to develop guideline materials, supervise and teach employees on insurance law and company procedures. While working at the insurance company my husband and I were blessed with three beautiful sons. After trying to volunteer in my children's classroom every chance I could, I realized that my true passion was teaching children instead of adults. I returned to college but this time to Concordia University to acquire my Teachers Certification and Masters in Curriculum and Instruction. I am so grateful to have the opportunity to teach in the district that I grew up in. The first two years in the district I was blessed to teach both third and fourth grade at Forest Glen Elementary School. Discovering my love for technology and appreciation for higher levels of thinking, I was thrilled to have the opportunity to teach fifth grade at Lineville Intermediate year last year. I am so excited to team up with two phenomenal teachers in our district, Laura Devine and Ashley Santelli. Laura is known for her in-depth teaching background and her passion for working with children. Although this will be our first year working together, we had an immediate connection and I could not be more thrilled to work with such an incredible educator who is always striving to meet all of the needs of each of her students. Although Ashley is a new teacher to our district, both Laura and I had the opportunity to be on the interview committee where we were amazed by Ashley's professionalism, organization, dedication, and true desire to connect with her students. She will prove to be the collaborative and perfect fit for our EPIC team.